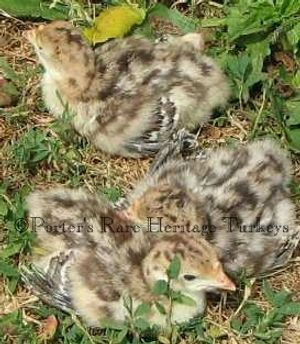 The "Red Bronze" looks somewhat like a typical bronze except they have a very overall reddish coloration, They do not have the typical black and white barred wings like in a normal bronze.They are a bronze based bird with a single recessive red modifying gene. They are also known by a few other names like, Red Auburn,Light Bronze, "washed out" Bronze, Cinnamon and Bronze Red. Whatever you want to call them, they are basically a bronze with the addition of a single recessive red gene. They do not breed completely true, 3 varieties are produced, Red Bronze, Bronze and Bourbon Red. 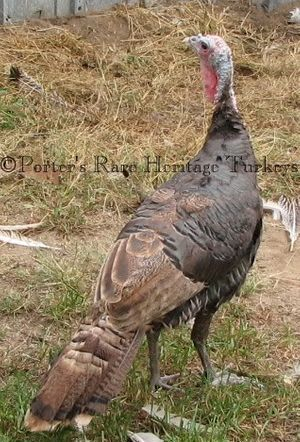 The Red Bronze at hatch has the same typical stripped pattern as a bronze poult except the normal black strips are replaced with reddish strips.